The sprayground opened for the season Friday, May 25! 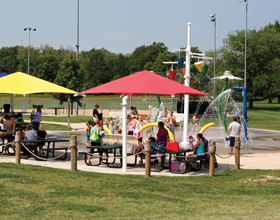 If you are planning a group visit to the sprayground this summer (groups of 10 or larger), please complete a sprayground group visit request form. Half of the park shelter (6 tables) is available for paid group reservations from 10 a.m. – 2 p.m. or 4 – 8 p.m. daily, while the other half of the shelter always remains open to park visitors.